Opp which is a Chinese smartphone manufacturer has been launching many smartphones in India from previous years and the company is going to launch new smartphones this year in India as well as China. However, Oppo has not yet released a new smartphone in India but the company is expected to launch the flagship smartphone from the company which will be named as the Oppo R15. Now, the release date of the Oppo R15 has been revealed by the company in form of a teaser. 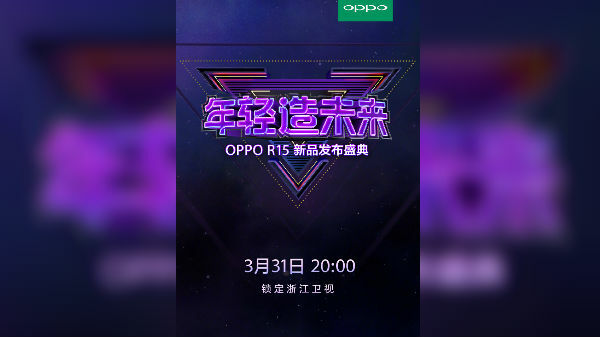 As far as the release date is concerned, the Oppo R15 will be launched in China on March 31. Apart from that, it is also known that the Oppo R15 will be launched by Zhang Yishan, a Chinese actor in the country. Also, it is expected that the Oppo R15 will be launched in two variants where one will be a standard variant and the other variant will be named as Oppo R15 Dream Mirror Edition. Now, it is already leaked that the Oppo R15 will have a notch on its display and the design of the phone will be similar to that of the iPhone X at least from the front. As far as the specifications of the Oppo R15 are concerned, the device is expected to be powered by the MediaTek Helio P60 processor whereas the Oppo R15 Dream Mirror Edition will come with Snapdragon 660 processor. Also, the device will come with a 6.2-inch AMOLED display along with an aspect ratio of 19:9. Also, it is expected that the Oppo R15 will run Android 8.1 Oreo out of the box at launch which is the latest version of Android and the device will have Oppo’s custom skin, Color OS 5.0 on top of it. Stay tuned to know more about the Oppo R15 on March 31.